Bicycle commuter accidents in Southern California are more of a problem than one might think. When we usually think of people riding bikes in SoCal, we picture wheeling along the Venice CA boardwalk or through Santa Monica, Huntington Beach or San Diego trails near the bay. However, when you analyze the statistics, it turns out that the majority of bicycle accidents in California occur during the work day. Based upon numbers provided by the California Highway Patrol and the California Department of transportation, the majority of bike crashes in CA happen to male riders (and female riders in lower numbers) between Monday and Friday. In fact, the “peak day” for CA bicycle crashes is Thursday! 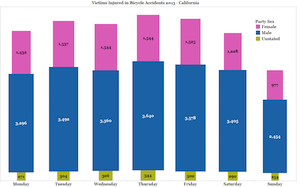 Why do so Many Bicycle Crashes in Southern California Happen During the Week? The “simple” answer would be that there is a lot more vehicular traffic on major roadways in Los Angeles, San Diego, Orange County and the Inland Empire during the week. This is definitely part of the equation. On average, cities like L.A. have up to 8 peak hours of “rush hour” during weekdays compared to 5-7 in most major urban areas. The other part of this equation is the increased use of bicycles as forms of transportation to get to and from work or for other utilitarian purposes such as running errands to the store and commercial transactions such as delivery of goods or services. While the majority of individuals still choose to get in their car and drive to work, school, a store or restaurant, there are a growing number of persons who are using bicycles. When looking at the locations of bicycle accidents in Los Angeles, it would appear that economics play a large factor as well. The majority of incidents in L.A. occur in less economically advantaged neighborhoods like South Central and East L.A.
Studies have shown that many other factors come into play such as persons rationalizing based upon time, cost and environmental factors as well as social attitudes towards modes of transportation. One such study, conducted by the University of California at Davis concluded that, in an average urban environment like San Diego or L.A., all of these factors come into play a role with approximately 34 percent of those studied being “auto-centric” or only using motor vehicles for transportation, 26 percent using walking, biking or public transportation exclusively and approximately 40 percent of individuals using a combination of automobile travel, public transportation and biking or walking. All of these statistics show that bike riders in Southern California need to be extra careful and defensive when operating a bicycle on the busy roadways during the peak hours of travel for motor vehicles. If you are involved in a bicycle accident during such hours, it is also important to try to stay as calm as possible, take pictures of your bike and the involved car and seek prompt medical treatment if you are injured. Rush hour commutes can be chaotic and this leads to sometimes erratic and illegal behavior on the part of drivers including hitting and fleeing the scene. Try to obtain a full or at least a partial license plate number to identify any such driver. Most importantly, if you are injured, you should seek out the assistance of a bicycle accident attorney familiar with investigating bike commuter claims. A lawyer can be your best advocate in getting to the bottom of what happened, obtaining evidence to prove legal liability, and getting maximum compensation for your injuries.